The following table is an honest attempt to discern the risks and benefits of several different beach fishing systems. If you take the table as read you will easily determine the safest areas to deploy any electric kontiki with minimal risk is on the east coast. While some electric fishing torpedoes are certainly powerful enough and fully capable of towing your line out through surf, once the motor switches off the current can quickly get hold of it. Having a large delta fishing kite and kiteline in addition to your existing electric kontiki rig gear makes a lot of sense and means you can truly enjoy the best of both worlds while reducing the risk of losing your electric kontiki, and wear and tear on it, by a huge margin. 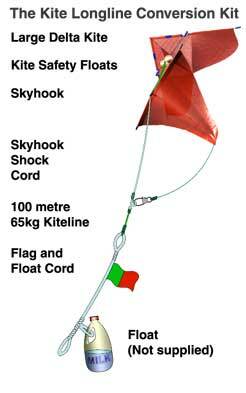 The conversion kits below are designed for the fisher who already has an electric kontiki or fishing torpedo and wishes to be able to quickly convert their gear into an extremely efficient kite fishing system when conditions change or are too risky in the areas they want to fish. Electric kontikis like the Powertiki and Challenge fishing torpedo are extremely good at setting longlines in most conditions on the east coast and they represent a major step forward for land based fishing, but they are not the total answer to fishing anywhere, anytime and neither are kites. It just makes so much sense to use your electric kontiki in the safest areas possible and then only when you have to. If you only use you electric kontiki from clear sandy beaches on the east coast when its calm or the wind is wrong for kites in your area you will do extremely well as this is really where electric kontikis excel. The east coast is the safest place to fish an electric kontiki longline - and it is also the safest time as you will have the whole beach to yourself free from the risk of tangling with kitefishers. The main reason most electric kontiki fishers initially get a kite is to fish on the west coast and chase the phenominal catches of huge snapper the area is renown for. Unfortunately this is also where sharks, strong currents and high surf can cause problems for electric devices. 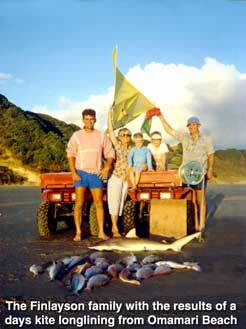 Many fishers who use an electric kontiki also use kites when the swell or current is too strong for their device. On the west coast sharks present a risk as they can bite through the mainline causing the loss of an expensive electric kontiki. 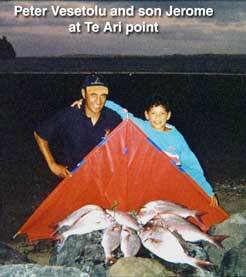 We recommend fishers with electric kontikis use them only on the east coast where there is less chance of losing it. When it blowing easterly and too rough to fish the east coast, simply use your existing fishing rig powered by a kite on the west coast without risking your submarine. This is all you need to convert your existing kontiki longline into an efficient kitefishing rig. A complete pre-tied kiteline is wound backwards onto a card ready for you to clip to the end of your existing knotiki mainline and set your gear. 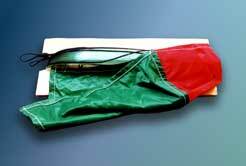 It only take a few seconds to put the kiteline on for kitefishing or to take it off when using the kontiki. The ultimate in kitefishing technology to convert your existing kontiki rig into a highly efficient and powerful kitefishing longline rig. The pre-tied kiteline is ready for you to connect to the end of your existing longline.